Also serving communities of Spring Lake, Ocean Grove. There are 9 Memory Care Facilities in the Wall area, with 2 in Wall and 7 nearby. The average cost of memory care in Wall is $4,350 per month. This is lower than the national median of $4,650. To help you with your search, browse the 20 reviews below for memory care facilities in Wall. On average, consumers rate memory care in Wall 5.0 out of 5 stars. Caring.com has helped thousands of families find high-quality senior care. To speak with one of our Family Advisors about memory care options and costs in Wall, call (855) 863-8283. Wall is located along the Atlantic seaboard in New Jersey, a state with 600,000 people living with Alzheimer's disease and other forms of dementia. Of the 27,000 residents in Wall, 20 percent are 65 and over, the age group most likely to experience Alzheimer's disease, Huntington's disease and related conditions. To provide support and safety for these seniors, there are two memory care facilities in Wall and seven more in nearby communities. These facilities can be housed in their own building or co-located in assisted living facilities with specialized programming for residents with dementia. 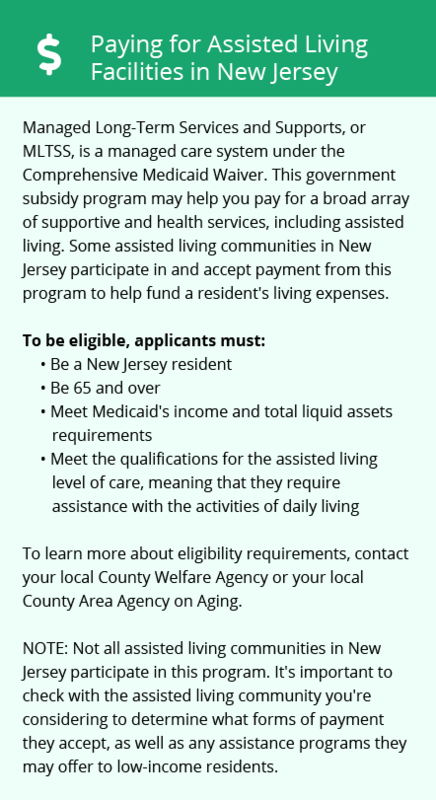 In New Jersey, Social Security benefits are not subject to state income tax, and while other types of retirement income are taxable, seniors over the age of 62 can claim a sizable deduction on this income. This may allow for more money in the budget for memory care in Wall. The cost of living in Wall is 155, compared to a national average of 100 and a state average of 133. This may be a consideration for budget-conscious families planning to move to the area to be closer to loved ones in memory care. Both property and violent crime rates in Wall are much lower than the national averages and on par with the state averages. This might make families of seniors in memory care a bit more confident in their safety. Also, seniors living in memory care have the advantage of additional security equipment, such as cameras and door locks. The air quality in Wall is 69 on a scale of 0 to 100, where 100 is best. This is better than the U.S. average of 58. Seniors with respiratory conditions may fair better in this region than in other similar-sized cities across the country. Memory Care costs in Wall start around $4,350 per month on average, while the nationwide average cost of memory care is $4,800 per month. It’s important to note that memory care rates in Wall and the surrounding suburbs can vary widely based on factors such as location, the level of care needed, apartment size and the types of amenities offered at each community. Wall and the surrounding area are home to numerous government agencies and non-profit organizations offering help for seniors searching for or currently residing in an assisted living community. These organizations can also provide assistance in a number of other eldercare services such as geriatric care management, elder law advice, estate planning, finding home care and health and wellness programs. To see a list of free memory care resources in Wall, please visit our Assisted Living in New Jersey page. 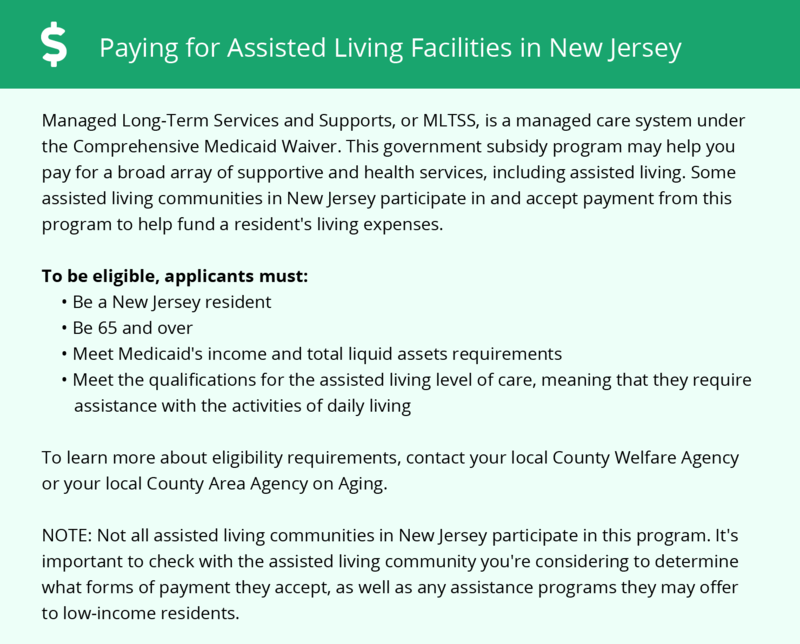 Wall-area assisted living communities must adhere to the comprehensive set of state laws and regulations that all assisted living communities in New Jersey are required to follow. Visit our Memory Care in New Jersey page for more information about these laws.